Dropsonde's dispersed by Aircraft Recon recorded winds of 199 mph within Earl at it's peak! 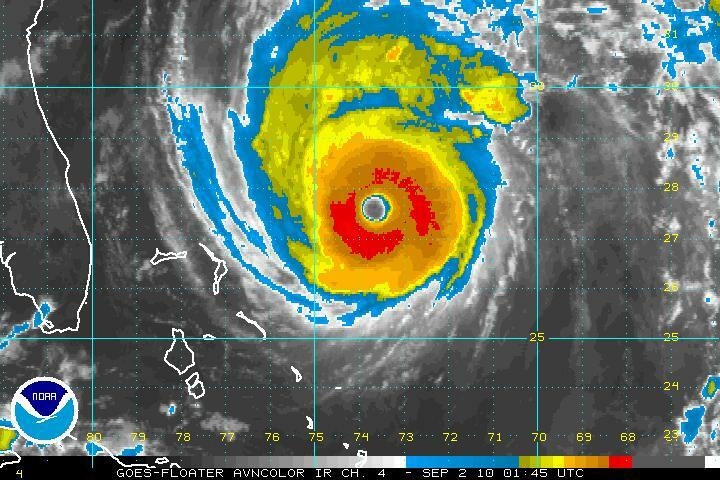 The amazing Image taken by NOAA of powerful Category Four Hurricane Earl on Wednesday night when the 199mph gust was recorded at "flight level" by the Hurricane Hunters. The Weather Channel's Carl Parker whilst talking on an earlier broadcast about the tropics, mentioned that the NHC's Hurricane Hunter aircraft during one of their mission's into Earl whilst the storm was at category 4 intensity on Wednesday night dropped a recording instument called a "dropsonde" and this relayed the information back to the team on the aircraft, the top "flight-level" wind speed was recorded at close to 150mph but what was more startling was a gust recorded at 199mph! Of course this wind speed wasn't a surface windspeed but more likely several hundred or more feet above the turbulent surface of the Atlantic Ocean between Puerto Rico and Cape Hattaras.